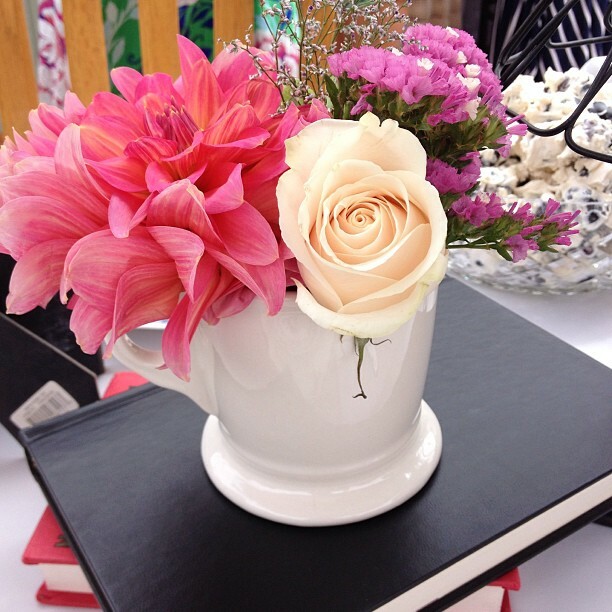 Attended the most beautiful bridal shower on Sunday – aren’t these centerpieces presh? And oh the macaroons that were there (not pictured, obviously because they were all eaten). Kind of obsessed with pistachio and almond ones. Then today, we went swimming and saw a mermaid – Jemma was thrilled! Chelsea commented on my cleaning calendar post with a great cleaning resource. I just discovered BlinkBuggy and love it! A perfect place to document all those little things that never make it into a blog post. A mama must have for sure. On my birthday list. Because I’m that crunchy :) What color though? Now that Google Reader is no more, how are you following blogs? I’m over at Blog Lovin’ – follow me! I went to a doTERRA gathering last week with this lovely lady and I’m so so so so so excited to start using essential oils with my family. Jemma has been getting lavender on her feet each night before bed and she has been sleeping noticeably better and I ordered the PastTense to help with my headaches. Yeah, can’t wait. Jemma adjusted super well to Max’s arrival last summer. But now that he can move about she has become super possessive of everything – toys, books, her bed, me. I’m doing my best to give her extra doses of attention, but it’s hard you know, with two kiddos following me around all day. But, yesterday we went to a movie together! Yippee for $1 summer kid movies! And last week we went to the mall to share a Starbuck’s breakfast and buy shoes for her flower girl outfit. She’s gonna grow up to be one of my bestest friends, I just know it. So … speaking of awesome girls, link up your Dear Daughter letter! Just might incorporate these darlings into Hannah’s bridal shower. My new favorite girl name is Elliotte. I’m usually not into gender mix-up names, but I think it’s so perfect and feminine. I’d nickname her Lotte (Lottie). Yep, Elliotte might give Ivy a run for her money. Would you listen to me going on and on about my fictitious third child? Please, just please. My hands are so freakin’ full right now. I can’t even comprehend. I watch zero live TV. I’m all Netflix over here. A few weeks ago I finished up Pretty Little Liars and then last night, Army Wives (Season 6 ended SO DRAMATICALLY! ), now I’m on to Revenge. There’s only one season on Netflix though and I’m halfway through. Next, I’m thinking Parenthood. Any other recommendations? Stay tuned for a post chronicling my 10 Things For Summer, here’s all the inspiration. It will be a small miracle if I actually complete all 10. And to think I considered making it 20!?!?! I just ordered a pair of glasses from Coastal – they’re free! Well, after I upgraded lenses and paid shipping they were $50ish, but still, for frames and lenses? That’s awesome! Share somethin’ you’ve been up to lately! Loves to you all! One of my baby girls is Elliot. I also struggle with dishing out extra attention to my tot, glad you are finding special things to get out and do with your sweet girl! My son had to have a surgery at 14 months, and I was really nervous about when to stop/start nursing before and after the procedure. I was sure to make it known that I needed to nurse him during recovery, and once the nurses were all aware that he was still a bf tot, they were super supportive and got me in to him ASAP. So be sure to let them know, it was a HUGE help for comforting him when he was just coming out of anesthesia. Parenthood is the best show ever!!! I flew through the old seasons on Netflix…then caught up on current seasons on Hulu. Now im sad cause its not on currently. You will absolutely LOVE it. I laughed, cried, got angry. I felt like the characters became my best friends. Ok…now im sounding a little crazy. But, really its a great show. Yay! So glad to hear things went well on the nursing front. Max is pretty much only comforted by nursing … occasionally playing catch, but I'm sure after surgery mama will be the only thing he wants :) They already said they'd come get me ASAP after the surgery so, I'm glad that you had that experience. It's super hard to balance keeping two love buckets full … not to mention a hubby's too! It leaves me feeling a little empty, but those smiles they flash you when they're all happy and enjoying their one on one time is just priceless!